When asked trick-or-treat, the answer is always most definitely, treat. Of course it’s been perfectly spooky and foggy the past two weeks without any rain, but last night it began drizzling – those poor trick-or-treaters. Nobody wants to put a winter jacket over their superman costume. For their sake, and mine (I am so excited to hand out candy!) I hope the rain dissipates by this afternoon for a dry night of ghouls and goblins. Last night I made some pizza dough for tonight’s dinner, and of course dessert. As if we haven’t already dug into the candy downstairs…oops. 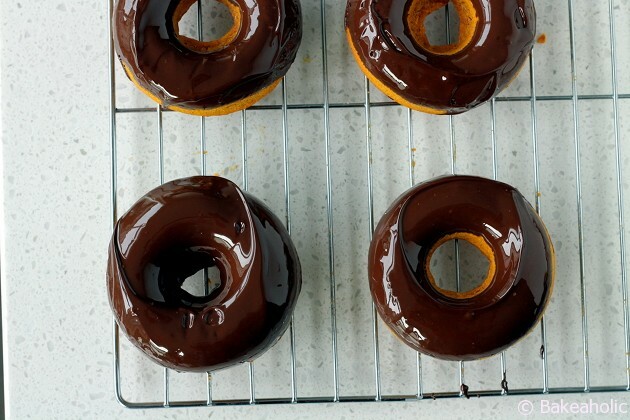 These are perfectly cakey, baked doughnuts that are easy and quick to make. I’ve never ventured into the fried doughnuts mainly because I’m afraid to be around a large pot of boiling oil. However, these are just as delicious. They are pumpkin spice, and a glorious orange colour perfect for the occasion. 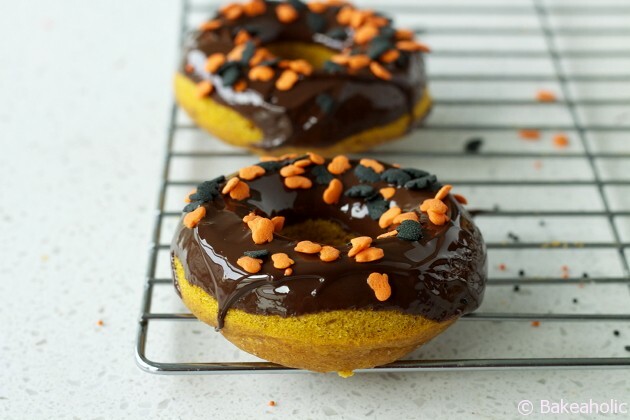 I topped mine with a chocolate glaze, as well as simple powdered sugar doughnuts. Enter Lainey as a lovely, organic 😉 , Strawberry. She even has a little hull hat to wear, if she lets me. 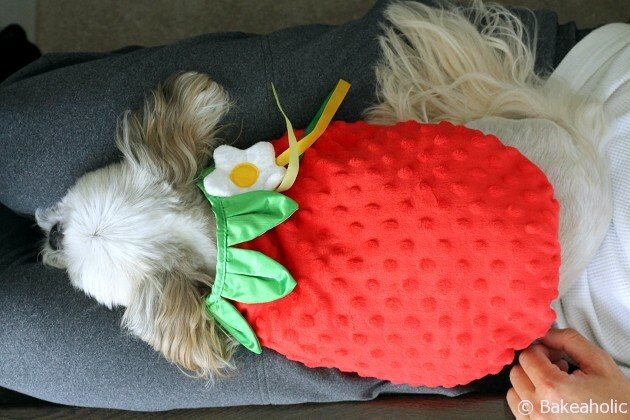 Leave it to her food-blogging mom to dress her as a fruit. Hope everyone has a spooky & safe Halloween night! 1) Preheat the oven to 350°F. 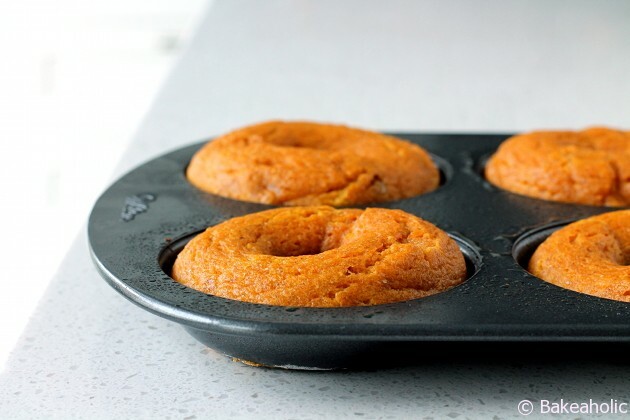 Lightly grease a doughnut pan with coconut oil or canola oil spray. 2) Beat together in a medium sized bowl with whisk the oil, eggs, sugar, pumpkin, pumpkin spice and baking powder until smooth. 3) Add the flours, stirring just until smooth. 4) Pour the doughnut batter into a piping bag and snip of the end. Fill the wells of the doughnut pans until almost full - it will produce larger, regular sized doughnuts that are nicely rounded. 5) Bake the doughnuts for 15 to 18 minutes. 6) Remove the doughnuts from the oven - let rest a minute. Turn upside down onto a pan or cooling rack. 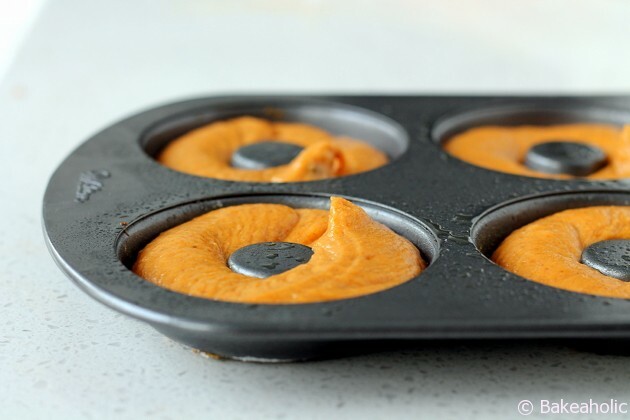 Allow doughnuts to cool completely. Melt the chocolate and coconut oil in a small ramekin in microwave on medium heat for 2 minutes. Stir to combine. 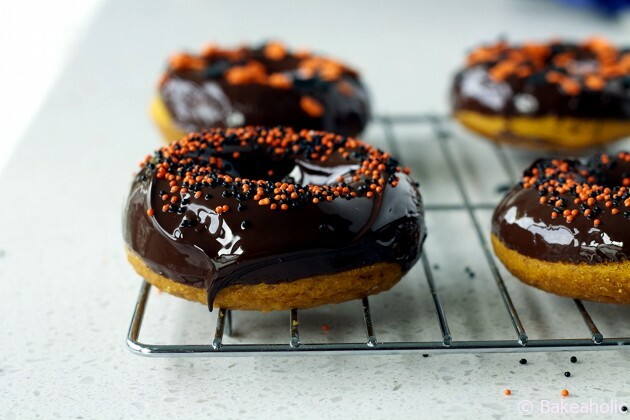 Dip the bottom/top of the doughnut into the chocolate allowing the excess to drip off. Turn right side up on cooling rack - add sprinkles immediately. Place the icing sugar in large ziplock bag. Melt coconut oil in small bowl in microwave 1-2 minutes. Using a pastry brush, brush the tops, sides and bottoms of the doughnuts - toss into the ziplock bag and shake until well coated.